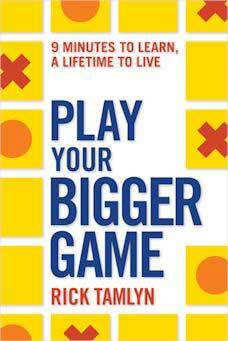 This is a review of the fun-to-read book Play Your Bigger Game by Rick Tamlyn. I really liked it, and am eager now to play my own bigger game! What I find compelling — and will discuss — is some of the philosophy behind it and why I think that basis is its winning element. The Bigger Game is designed to create a paradigm and perspective shift. It’s clearly not business as usual. In fact, speaking of business, you can apply it to that, or to your life’s work, but just as easily to anything that holds meaning for you. This might include relationships, personal activities, or your interactions with the world at large. Just about anything, really, big or small. Here are 3 of the main ideas that make it so different than a lot of the motivational how-to books I’m familiar with. One of the underlying philosophies of The Bigger Game is that goals are overrated. Rick emphasizes over and over your enjoyment of the process itself. When you choose the right game, this includes enthusiasm that you evoke in yourself, the creativity you open to, and the rewards you enjoy as you move around the board. So even though you have some objectives in mind (of course; it’s a game, after all), they are not the motivating factor as much as being in the moment, enjoying the moment, and being open to unforeseen ideas and opportunities. You’re encouraged to remain flexible, inspired, and responsive to what unfolds. Once you begin playing your own bigger game, something organic happens. You give up the need to control and strategize everything. It’s not that controlling and strategizing are bad and organic is good, but controlling and strategizing are tasks conducted from the left side of the brain (logic), and sometimes we need to lean a little more to the right side (creativity). Your attention isn’t all focused on outcomes. You’re involved in the playing! Since our experience of life is always in this moment, it behooves us to keep our focus there (or rather here!) instead of just looking ahead as we grind through necessary tasks simply as a means to an end. This idea in itself is very freeing. Not only does it feel good, but the spirit of play opens up our innate abilities to imagine, be inspired, get creative, try things out, and most of all, enjoy the process. This is a no-pressure situation. We play here. … When we play, we tap into our highest levels of creativity and engagement. … This is about finding your passion and purpose and whatever it is that so fully engages you that it never feels like work. To me, this element is crucial and if not for this idea, I wouldn’t even want to involve myself in this process. But because of the emphasis on play, I’m excited and naturally positive as I prepare to jump onto the game-board! Be open, available, and in the creative state of flow—fully engaged and always aware. … Don’t try! Be! Let go and trust the process, for there are already forces in play. By being a fully engaged participant in the game from whatever square you’re on, you automatically become more aware of being part of a bigger picture. You’ll notice many synchronicities that not only create new opportunities but can even act as a guidance system. A huge part of playing The Bigger Game is accepting that you don’t need the how; the game will take care of that. Rick is so good at helping you focus on and uncover whatever is important at any given square. You get the benefit of his and others’ practical experience with the game to such a degree that that you find yourself inspired as well as confident that his guidance will be beneficial. For each square, he offers detailed ideas and suggestions, often in the form of questions to ask yourself, and often things you wouldn’t even think of but that could make all the difference. It’s obvious how the resulting clarity will be a major element of what keeps you moving in a positive direction. In summary, this book offers you an enlivening framework for making more conscious decisions that are in alignment with what has meaning for you. Just as importantly, it offers excellent guidance culled from Rick’s own extensive experience. Priceless. I highly recommend you get the book and play your Bigger Game! I’m going to! Understand that you’re always on the game board. Instead of waiting for the future to come, why not make up your own life as you go? Thanks for reading, and have fun playing!